I got killed when I reviewed this because I wasn't a big fan of it. The action was awesome, but I felt like they piled on our hero too much. I mean, either kill his wife off or don't, but to kidnap the son, hit the son and wife with a car, then kill the wife in the hospital... it was like the poor guy kept getting sent to kick the ball while Lucy held it. On the other hand, the action and music were both great, and Kosugi held it down, so I'm willing to admit it was more me than the movie. I generally agree with your assessment, but maybe you have to be in a certain frame of mind. Also Limehouse Willy was a killer bad guy and we were just waiting for him to get "Sho'ed" up! Agree with DTVC completely on this. I found it kind of depressing, plus there was never a ninja to ninja finale. 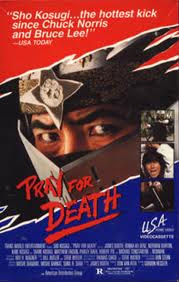 Still think Revenge of the Ninja is Sho's best, and tops in the genre.